An Example of "Basic Disk Will Convert to Dynamic"
"The operation you selected will convert basic disk(s) to dynamic disk(s). If you convert the disk(s) to dynamic, you will not be able to start installed operating system from any volume on the disk(s) (except the current boot volume). Are you sure you want to continue". What's the matter and what should I do? I don’t want to covert the basic disk to dynamic. When there are 4 primary partitions already, you’ll not be allowed to create more partitions unless you convert the basic disk to dynamic, which is largely because the basic disk was initialized to MBR. MBR, namely Master Boot Record, is an old partitioning scheme, where you can only create the maximum number of 4 primary partitions. In addition, the maximum addressing storage of MBR is 2TB. That’s why we can only use 2TB space of a 3TB or larger hard disk. Under this situation, if you want to create more partitions without converting to dynamic disk, there are 2 choices available: set one of primary logical or convert MBR disk to GPT. Firstly, you can set one of primary partitions logical. Once a logical partition exists, an extended partition is created, where lots of logical partitions could be created. But note you can’t set system reserved partition logical, because this partition should be set active while only primary partition can be set active. And we highly suggest changing a data partition to logical, and this partition had better be adjacent to unallocated space. To set primary partition logical, please download and install MiniTool Partition Wizard. Then, select the partition you want to set logical and choose "Set Partition as Logical" feature from the left side. 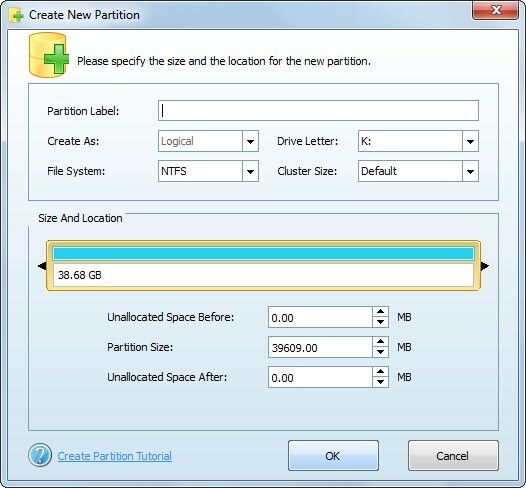 Next, select the unallocated space and choose "Create Partition" feature to create a logical partition. At last, click "Apply" button to make all changes performed. Alternatively, you can convert the basic disk from MBR to GPT since the latter supports up to 128 partitions. To change MBR disk to GPT, you can also use MiniTool Partition Wizard: select the MBR disk, choose "Convert MBR Disk to GPT Disk", and apply changes. But it should be noted that only MiniTool Partition Wizard 10 and more recent versions of Partition Wizard support converting system disk (the disk installing Windows) from MBR to GPT, and Partition Wizard 10 will be released in few days. Once the disk is changed to GPT, you can create lots of partitions without converting basic disk to dynamic. Are you troubled by "The operation you selected will convert basic disk(s) to dynamic disk(s)" issue when creating partitions? Now, try our methods to fix it.